We need your help in providing the funding required to have this iconic painting professionally conserved and prepared for display. As such, we are establishing a campaign to reach out to loyal supporters of Pax River and others who know the historic value of this enormous 12'x22' painting and the cultural resource that it will become. Patuxent River has been tied to human spaceflight since the day the Mercury astronauts were announced, with four of the seven as graduates of the United States Naval Test Pilot School. Many Naval Aviators have followed in their footsteps. 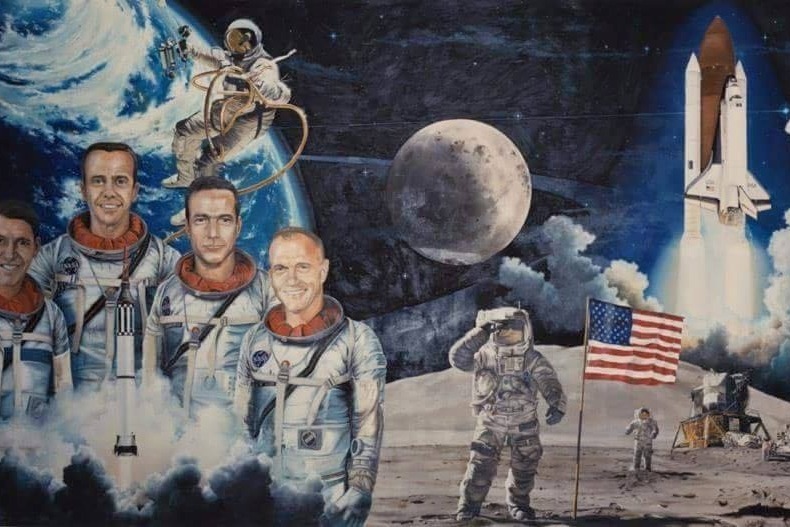 From Alan Shepard’s flight as the first American in space, to the Gemini missions including Gene Cernan’s spacewalk that developed the technology for Apollo astronauts John Young and Ken Mattingly, among others, to walk on the moon, to the launch of the Space Shuttle Columbia piloted by Bob Crippen, significant events like these are represented in artist George F. McWilliams’ mural “Naval Aviation in Space”. 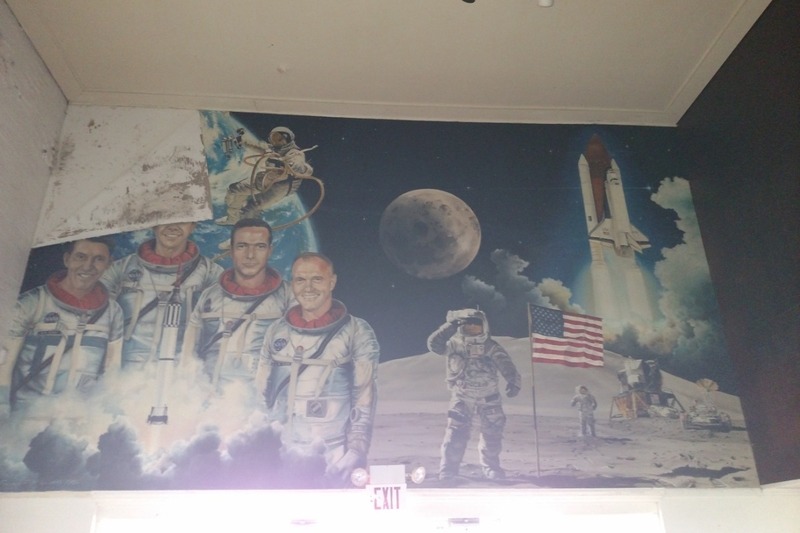 Unveiled at the Naval Air Station Patuxent River Officer’s Club on April 26, 1986, the twelve by twenty-foot painting is dedicated to astronaut Michael Smith. When the Officer’s Club doors were shuttered for the final time in December 2009, the painting was abandoned in place, left to live on only in memories. In late 2016, a small group of dedicated museum volunteers were able to convince the Navy to salvage the mural, with the help of Naval Air Station Patuxent River, the Naval History and Heritage Command, and the National Naval Aviation Museum in Pensacola, Florida, the painting has been placed in temporary preservation and storage until it can be permanently restored, and that must be finished within the next two years to prevent further deterioration. With your help, we can raise the $100,000.00 needed to finish the preservation and put it on permanent display as the backdrop for our “Naval Aviation in Space” gallery, due to open within the next year. The Patuxent River Naval Air Museum Association Board of Directors and staff are extremely grateful for your donation. Here is a hi-res picture of George F. McWilliam's "Naval Aviation in Space" when it was originally painted in the Cedar Point Officer's Club. Once restored, the large 12'x22' mural will take on it's original look and hang in our Test and Evaluation Hall.